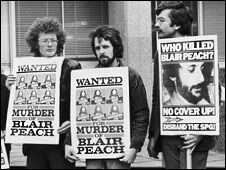 Prosecutors are to consider further investigations into the death of activist Blair Peach who was killed at a demonstration in London 30 years ago. Mr Peach, 33, was fatally injured as police dispersed an anti-fascist protest in Southall, west London. The Crown Prosecution Service said it would review the findings of an internal inquiry into his death. It comes as police prepare to publish the report that examined if there was evidence Mr Peach was killed by police. The report, by Commander John Cass, was thought to have recommended the prosecution of police officers, although this never happened. Despite a campaign by Mr Peach's family to release the report it has stayed secret. Jenny Jones, the Green Party London Assembly member, put forward a motion to the Metropolitan Police Authority for the report to be made public. In June commissioner Sir Paul Stephenson ordered it to be published, with some details censored, and it was given to the CPS on Monday. A Metropolitan Police spokesman said: "At the request of the Met the CPS has agreed to review the Blair Peach Report and provide advice as to whether any further investigation would be justified. "This independent oversight should provide clarity to the family of Blair Peach that the Met has exhausted all investigative options." However, Mr Peach's former partner Celia Stubbs said she was worried the decision to send the report to the CPS could be a delaying tactic and that a report was now unlikely to be published until Spring. "It is bizarre that also it could be a delaying tactic," she said. "It is quite bizarre that maybe they are worried as there has been quite a lot of bad publicity. "It is going to take several months to look at the report and that could be a real postponement tactic."